Are Apple's phones REALLY 'bigger than bigger'? Much like last year's iPhone 5S/5C rollout, this year's iPhone double whammy will surely have Apple fans in a fluster as they try to answer the biggest question of the week: do I go bigger, or do I go BIGGER? 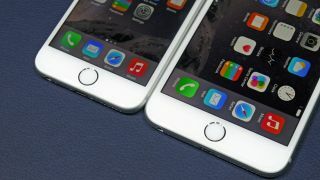 Well, luckily TechRadar's phone pro is on hand to help you decide between the iPhone 6 and iPhone 6 Plus with in-depth, under-the-skin, no-holds-barred reviews of both handsets. Phones and Tablets Editor Gareth Beavis gave the iPhone 6 a respectable 4.5 stars, stating: "It's the first time I'd even consider using an iPhone as my daily device, thanks to the larger screen, better keyboard and most importantly upgraded battery life." But did he have any reservations? Then he wrapped his hands around the bigger sibling (and new member of the iPhone family), also returning with a 4.5 star verdict. He describes it as "the best looking phablet around", though adds that its specs don't match the Android powerhouses of the world. And starting today, Apple will begin rolling out its next big software update: iOS 8. There'll be plenty of new features to get your teeth stuck into, and we'll keep you posted as to when you'll be able to download it.